Clean water is now much closer, and that is something to celebrate. KANSAS CITY, Mo., March 21, 2013 /3BL Media /PRNewswire/ - World Water Day is March 22, and the children and youth of Children International are celebrating around the world. They know firsthand the difference clean, accessible water can make in their lives. Some of them also know what it feels like to make clean water available to others. 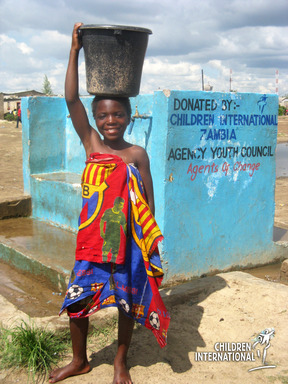 In 2012, the youth of Children International in Lusaka, Zambia, dedicated their Youth Empowerment Fund to extend the supply of clean, piped water to the poor community of Chibolya. The Chibolya compound is prone to waterborne diseases like cholera. The area has experienced high incidents of severe diarrhea, especially among children. (Diarrhea is one of the top causes of child death in Zambia.) Although Chibolya is very close to Lusaka's central business district, the area was an unplanned settlement, and the indiscriminate construction of shacks and other buildings has left little space for the provision of proper roads, electricity and piped water. The few water stands that were available could not meet the demand of over 28,000 people who live in the area. Consequently, children spent a lot of time in the long queues after walking 1.5 kilometers as they tried to access clean drinking water. The Youth Council was aware of this water problem, as some of them live in that area, and they voted to direct their annual Youth Empowerment Fund to erect tap stands for the community. Construction was completed by the Chibolya Water Trust, and Children International youth participated in laying the pipes. Jonas Chishimba, Manager of the Chibolya Water Trust, explains, "We had no capacity previously to expand the water network to Chibolya extension." The result, Mr. Chishimba explains, "We are servicing more than 3,000 people. So you can see that with their help, the impact has been immense in that we are able to go into areas where we failed due to lack of capacity.... It is clear that there is a reduction in the cases of diseases being recorded that are caused by the lack of clean water. Increased access to clean water has greatly helped." The Youth Empowerment Fund is an important part of Children International's comprehensive youth program. Every year the Youth Council in each of Children International's sponsorship agencies around the world votes on where to direct the funds. Children International's President Jim Cook notes, "This project is just one example of the positive outcomes when youth are given a safe place to go with caring adults and constructive activities. Our youth are working to make a positive change in the world around them." Mirriam, a youth participant in the project sums it up, "We are happy to see the project which we started. It is a success. Many people are benefiting, and personally I am happy with what we are doing through Children International." See more information about Children International's water and sanitation projects. Make a donation toward water and sanitation projects for an impoverished community. To help a child living in poverty, visit www.children.org. Established in 1936, Children International is an award-winning humanitarian organization. Children International's programs benefit approximately 340,000 children and their families in 11 countries around the world, including Chile, Colombia, the Dominican Republic, Ecuador, Guatemala, Honduras, India, Mexico, the Philippines, the United States and Zambia. For more information or to sponsor a child, visit www.children.org.